The first 100 days - how are we doing? “The start of a process that will transform how we provide services...to make them...fit for the 21st Century – agile, flexible and digital by default”. That was how Francis Maude described the Government Digital Strategy, published in November 2012. You may have read in earlier posts that the strategy set out 14 actions for departments to respond to. It was followed up in December 2012 by departmental digital strategies, where each department set out their own detailed plans and commitments on how they would transform and improve their services to meet user needs better and achieve savings. An ambitious agenda. So how do we keep track of what is happening? Digital Leaders meet monthly to advise on cross-government work towards services that are digital by default, as well as championing digital development within their own departments. 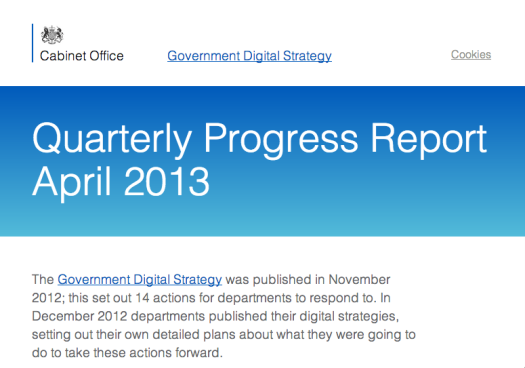 Each quarter they review high-level progress against the Government Digital Strategy. In the spirit of transparency they decided to publish these quarterly progress reports - hence this post. We’ve just got to the end of the first 100 days since publication - what have we been doing to make the Digital Strategy a reality? starting to get empowered people with the right skills in place. Some departments have already started to establish specialist digital teams to support these changes; others are assessing what skills they need. GDS itself is setting up a programme of work to support digital skills development at all levels across government. We are already sharing best practice through things like this blog, and our Sprint 13 event. beginning the 23 transformational ‘exemplar’ projects identified in departmental strategies. Work has already begun on 15, with 9 at alpha/beta delivery stages, 4 in the ‘discovery’ phase, and 2 at initial engagement stages. We expect the remainder to move into discovery phase during the next quarter. continuing to move departmental information and services across to GOV.UK. Most departments have now done this, with the remainder due to have moved by the end of April. establishing clear guidance to assist departments in making services digital by default - take a look at the beta version of the Government Service Design Manual to find out what services need to do to achieve the Digital by Default Service Standard. (And feel free to feed back to us where you think that it could be improved for users). To find out more, read the full Digital Leaders’ quarterly progress report which gives examples of departments' actions. Over the next quarter we’ll be building on these foundations, and delivering visible changes. Watch this space. I am a web designer, specifically and interface and user experience developer and this new site is excellent! There are no bells and whistles distracting the user, everything is logically laid out and clearly labelled, and I could find what I was looking for in less than 30 seconds. For the end user this is an absolute win. A thorough well done to whom ever was overseeing this project and kept it on track. We may still have work to do with regard to a digital presence, but at least there is a clear goal to work towards. Well; 100 days in eh? Not much to show for it. I've seen so much negative feedback about this from users on the web - but absolutely no effort from you guys to address the issue - or to make suitable info & materials available again. More economies on part of government? Look good - do nothing. Simply re-directing visitors to the .gov.uk website is a rubbish 'service' as it contains no real information to help real people implement things on the ground, in day to day life. I'll bet this comment is not posted either... So much for democracy!